Recent news stories suggest a large uptick in LED installation in professional sports stadiums across the United States and the globe. They are an obvious choice for such large and expensive to light venues. 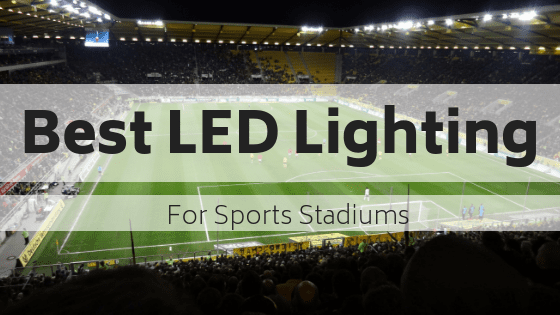 However, there is more that goes into choosing and installing LED lighting in stadiums than you might think. There are different requirements based on the sport, size of the arena and field, all while taking TV broadcasting into account as well. Apart from the much-stated benefits of energy efficiency, money savings, and overall brighter lights, sports stadiums benefit from LEDs in interesting ways. High quality, high lux level lighting is essential to keeping players safe on the field, as well as providing the best light possible for TV broadcasting. This allows for the best picture on spectators screens at home, as well as easy to see plays by fans at the stadium itself! The Illuminating Engineering Society (IES) has created a guide for lighting arena and recreational sports spaces, and there is more variety of lighting needs than you would expect. Based on the pace of the game, the number of players, viewing distance, field size, and more all play a part in determining the best lighting. Lighting designers must also work around other sources of light and reflection, such as scoreboards, flooring, and weather conditions such as rain, snow, and ice. Depending on the sport and the arena, different requirements must be met for lighting lux or the intensity of the light. Most Class 1 stadiums require a minimum of 500 lux for their lighting. However, it is also common for top-level competitors and teams to require at least 800 lux, upwards of 1200 lux at times as well. This allows for TV stations to offer the best, high-definition quality TV for at-home viewers. No matter the sport or location, the main concern with lighting a stadium is visibility for players. Being able to see the ball, field markers, end zones, golf greens, tennis lines, and so much more is important for good play. Sitler’s installs lighting for school district gymnasiums and outdoor fields! While not near the level of lighting needed for a professional sports stadium, Sitler’s has yours covered. Call us at (319) 653-2123 or send us an email to learn how to get started.